caused delays on I-90 on April 22. WOW what a difference a weekend can make. 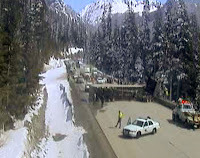 An overturned semi-truck carrying onions may have had drivers in tears due to a closure of westbound I -90 near the summit of Snoqualmie Pass for hours last Friday, April 22. Drivers traveling eastbound were also caught up in delays associated with a traffic shift due to construction on a project to replace broken and deteriorating concrete between Cle Elum and Easton. Hopefully, this weekend onions won’t be flying and blocking I-90 over Snoqualmie Pass. However, the traffic shifts near the I-90 Lake Easton to Big Creek project between Cle Elum and Easton will still be in place. What does this mean for you the driver or passenger? Plan ahead. We see a significant increase in traffic traveling eastbound over I-90 on Fridays. It must be all of you trying to get out of the rain and into the sun. To try and lessen the impact to traffic, we are going to keep two lanes eastbound and one lane westbound open on Fridays. We will be doing the same on Sunday, but in reverse. We will have two lanes westbound and one lane eastbound open. You will need to plan for at least an hour of added travel time, maybe more. It all depends on if there are any incidents, like flying onions that will cause additional back-ups and delays. This traffic shift will be in place until Memorial Day. Then we will make sure the lane shifts are done at night to reduce delays for your summer travel plans. Also be aware, that crews will continue to chip away at the rock slopes near the snowshed east of Snoqualmie Pass with rock blasting. These controlled blasting operations will resume in May and will make room for us to widen I-90 from four to six lanes. You will need to plan for hour-long closures until late October. Crews will perform blasting operations Monday through Thursday an hour before sunset. Drivers should check our What’s Happening on I-90 website for specific blasting dates and times or follow us on Twitter. Summer is here, which means the orange of construction is all over. The more you know and plan ahead before you head out the door the better off you will be! You recycle those paper cups, bottles and old documents to keep them out of the landfill. Curious to find out how much landfill space a 300-foot-long, four-lane bridge would take? Neither was our I-405 project team. 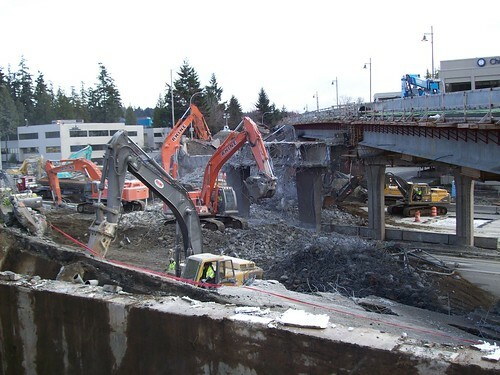 That’s why we recycled 100 percent of the NE 12th Street bridge in downtown Bellevue after crews demolished it in March to make way for a longer, wider bridge to connect new ramps to I-405 and SR 520. After bringing down the bridge, crews hauled away nearly 4,000 tons of concrete, 225 tons of rebar and truck loads of wood to recyclers. In addition to cutting carbon emissions from production, recycling construction materials saves money. The state does not require recycling in bridge demolition, but it is becoming the norm as the market for recycled materials grows. Today we routinely write construction specifications that make it easier to recycle materials. Plans often require concrete be laid in panels for efficient removal and recycling, and they allow a higher percentage of recycled materials in cement than was the standard in the past. “It’s one thing to recycle material,” said Steve Mader, an environmental manager for I-405 Corridor Design-Builders, “but it’s better to upcycle” or preserve materials during demolition to keep them in good condition for reuse. His firm routinely crumbles concrete on site for use as base rock. And his crews take care not to twist and mangle used rebar, which can increase its market value as much as five times. Starting back in the 2002 with its Record of Decision, the I-405 program has followed a guiding principle to leave the environment better then it was found, Javeri said. That means building better drainage and filtration systems, planting more vegetation and recycling more materials. Visit the Sustainable Transportation Web page to learn how we support the environment, economy and communities in our mission to keep Washington moving. May, which happens to be Motorcycle Safety Awareness Month, is just around the corner, and the AAA Foundation sees no better time to shed some light on the subject of biking best practices, particularly on the heels of a recent report on motorcycle fatalities released last week by the Governors Highway Safety Association (GHSA). The report found that while motorcycle deaths declined by 2 percent overall in 2010, the third quarter actually saw a spike in fatalities compared to the previous year. This has some experts worried that the upward trend in motorcycle deaths the United States saw from previous years might be returning. While these numbers could be attributed to a variety of things, such as an improving economy stimulating motorcycle sales or less rain and warm weather extending the riding season, the fact remains that more bikers on the road means more exposure to risk. With temperatures heating up, daylight lingering longer and gas prices soaring, people are likely to dust off the Harleys and hit the open road as both an economic and enjoyable transportation alternative. The Foundation just wants to ensure that in doing so, safely and responsibly remain top of mind for riders. Motorcycles are entitled to the same rights as any other vehicle on the road, and as such they need to follow the same rules. A motorcyclist has a much greater risk of experience a serious, life-threatening injury in a crash than a driver or passenger of a car because there is far less protection for riders. Most states have implemented helmet laws and encourage riders to take extra precautions before hopping on the back of a bike, like always wearing a helmet, never riding drunk, keeping speed in check, and most importantly receiving the proper training. This is especially true for the baby boom generation—a group that seen a recent uptick in motorcycle registrations—who are reaching retirement age and looking to recapture the riding passion of their youth. No matter the age or the perceived experience level, training is a must for all motorcycle operators. But make no mistake, the responsibility for keeping our roads safe extends to motorists of every stripe. Car and truck drivers need to be mindful of motorcyclists’ vulnerability and exercise increased caution when encountering them on the road. Sharing the road is the only way to reduce traffic crashes, so do your part this month and every month to be safe behind the wheel … and the handlebars. Update Feb. 5, 2015: For information about the I-405 express toll lanes, visit our Flashing lights signal I-405 express toll lane equipment install blog. Drivers seem to love choices and that’s exactly what we’re offering toll payers who set up Good To Go! accounts. With a prepaid account, tolls are electronically deducted without stopping or slowing down. Once you have an account, it’s good on any tolled facility in the state. Switchable pass: Well-suited for SR 167 HOT carpoolers as it can be turned on or off depending on the number of people in the car. Sticker pass: this permanent sticker cannot be moved between vehicles and cannot be turned on or off. Motorcycle pass: Adheres to motorcycle headlamp light or visor. License plate pass: Mounts on the front license plate. Do you frequently carpool in the SR 167 HOT Lanes in this vehicle? Then you should choose the $12 switchable pass that can easily be turned off and on. Switch it off if you’re carpooling in the HOT lanes and switch it back on when driving by yourself or using one of the tolled bridges. Are you looking for the cheapest option? The $5 sticker pass is the best value and has proved to be the most popular option among drivers. It’s about the size of a small band aid and sticks to your windshield behind the rearview mirror. But, once it’s installed, you can’t move it to another vehicle. And, if you carpool in the SR 167 HOT lanes, you can’t switch it off. You might want to have a permanent sticker pass for each of your vehicles. You can register up to six vehicles on a personal Good To Go! account, each with its own pass, drawing from the same pot of money. You also might consider an $8 movable pass that can be shared among vehicles. It sticks to the inside windshield with Velcro and can be transferred from car to car, as needed. You also can hide it in a special metallic bag if you’re carpooling on the SR 167 HOT lanes, although it’s not as convenient as the switchable pass for that purpose. Are motorcycles your thing? We have a great new sticker pass that goes on the motorcycle’s headlamp. It’s clear, so it virtually disappears once you install it. You might choose the $12 external pass that screws into the frame of your front license plate. It’s in a hard black plastic case that can withstand the elements. You can also opt for no pass at all and just register your license plate number(s) on your account and get charged an additional 25 cents per trip for the extra processing costs. The beauty of choices is that you can pick just the right Good To Go! pass options to meet your needs. Want to know more? Check out our great “How To” video that describes each of the passes and shows how they’re installed. Or, take our quick quiz to help you narrow down your pass choices. With the 2011 Illinois Distracted Driving Summit taking place this week, the AAA Foundation wants to remind everyone of the many forms distraction can take behind the wheel and how important, and simple, it is to avoid. While cell phone use and texting behind the wheel is a potentially deadly distraction, drivers shouldn’t forget about other sources of distraction inside a car that have been around for years, long before cell phones were even invented. Experts estimate that drivers do something potentially distracting more than 15 percent of the time their vehicles are in motion. This can range from changing the radio station to eating on the go to punching an address into a GPS. These potentially deadly actions pull your hands off the wheel, your eyes away from the road and your attention away from the task at hand—operating a powerful piece of machinery at high speeds over changing terrain alongside others doing exactly the same thing. While some car designs practically encourage this behavior—iPod connections in the console, cup holders for every passenger and dashboard navigation systems becoming more and more common—drivers need to remember the safe ways to engage in these activities, which is while the car is stopped. Don’t touch that dial – adjust your seat, air conditioning and music before you even turn on the car, or wait until your stopped at an intersection when you’re on the road. Stop to eat and drink – while it’s tempting to cruise through the drive-thru to save time, it’s always safer to stop for meals on road trips. Plan ahead – set up your navigation system before your car leaves the driveway, or have a passenger make adjustments to your route for you along the way. Don’t multitask and drive – in a world where speed and efficiency rule and multitasking is becoming a necessity in nearly every situation, make driving a place of refuge to do just one thing at a time, DRIVE. We also challenge you to take the pledge to drive distraction-free for a one week. Driving while distracted is something we are all guilty of from time to time, but we all agree that its dangerous. Changing the “do as I say, not as I do” mindset is the first step to reducing the more than 5,500 deaths every year that result from this tendency. So do your part and lead by example. The next life you save could be your own. What happens in Vegas may stay in Vegas, but what happens in Aberdeen goes around the world. 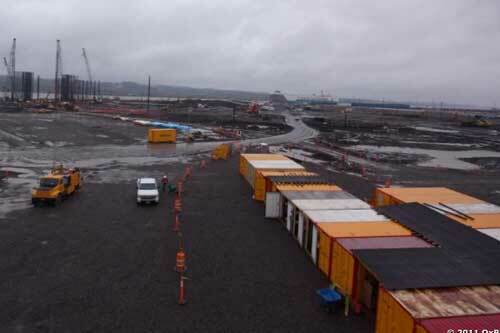 Working with our contractor Kiewit-General this week, we installed a webcam at the SR 520 Pontoon Construction site, providing people everywhere a peek at one of the state's mega projects. The camera takes photos every 10 minutes at the site, 24 hours a day, seven days a week. You can watch the work happen as it happens – which will include everything from excavation of a casting basin large enough to hold an aircraft carrier to construction of floating bridge pontoons the length of football fields. The website will store all these photos, so you can also turn back the clock to view previous work on the job – hours, months or years after it occurred. You can also use the time lapse function, which takes a photo each day, to watch months and even years of construction whiz by in just a few minutes. A photo calendar provides an additional tool, giving a way to scan the project a month at a time and key in on certain dates of interest. Work started at the 55-acre site on Grays Harbor in February, and since then we, along with K-G, have been busy clearing, dewatering and driving 900 steel piles 135 feet into the ground to construct the foundation for the pontoon casting basin. Excavation of the 4-acre basin starts the week of April 18, and requires crews to remove upward of 260,000 cubic yards of material. As sections of foundation piles are driven and dirt is excavated, workers will begin placing concrete for the basin. We are on track to start constructing 33 pontoons this July that will be used to form the backbone of a new SR 520 floating bridge. The pontoons will be built in six cycles with the final cycle being completed in May 2014. 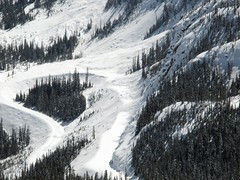 Crews have started clearing efforts for North Cascades pass. This week on “Good Morning America,” the AAA Foundation was asked to comment on the dangers of road debris as part of a story featuring a viral video of a 2x4 crashing through a car windshield. The video was captured by the car’s driver, Wendy Cobb, who said she was using her cell phone camera to film the two trucks driving erratically in front of her when both trucks hit the 2x4 lying in the road and caused it to come flying through her windshield! Fortunately no one was hurt, but our research shows that vehicle-related road debris causes an estimated 25,000 similar crashes per year, resulting in approximately 80-90 fatalities. This video is an example of just how hazardous and frightening a collision with road debris can be. But, there are two important lessons to learn from this video as well that can minimize your risk for a similar collision. 1. Be alert and avoid distractions. Using a cell phone while driving, to text, make calls, or to video another driver’s behavior, is distracting and makes it difficult to react quickly or to identify potentially dangerous situations … like a 2x4 heading for your windshield. Accidents can happen anywhere at any time, and driving while distracted only increases your odds of being in one. 2. Keep your distance from suspicious items or activity on the road. Despite Wendy’s good intention of closely following to record the two trucks driving recklessly, it would have been far safer to drop back to disengage from their behavior, or to stop and call the police to report the activity. A matter of inches can mean the difference between life and death when encountering road debris. Unfortunately, not everyone will be as lucky as Wendy. So, learn from her close call to protect yourself and the ones you love. Wahkiakum County officials have our thanks for quickly stepping up and adding extra runs on the Lower Columbia River’s last remaining ferry, the Wahkiakum. This helps meet the unusual demand as people find ways to deal with the closure of State Route 4 about 5 miles west of Longview on the Washington side of the Columbia River. A mudslide Tuesday morning covered SR 4 near Stella. In the process of cleanup, geotechnical experts discovered that the hillside above is unstable. Unfortunately, this means the road will remain closed until early next week while a contractor excavates the unstable slope and removes dangerous trees. Because of the increased demand, Wahkiakum County has essentially doubled the frequency of the ferry service and extended operation to 24 hours a day, instead of the usual 5 a.m. to 10 p.m. schedule. If you have never ridden this unusual little ferry, put it on your list of things to do – perhaps not now, however, because the wait time can be as long as three hours because of the SR 4 closure. The county has operated the vessel since 1962, with financial support from the state of Washington since 1969 since it is considered an extension of SR 409. The Wahkiakum operates 365 days a year with a minimum of 18 runs a day – basically on the hour from the Cathlamet side. The ferry and its predecessor vessels have an interesting history that goes back to 1925 (pdf 12 KB). While you’re at it, consider exploring the historic town of Cathlamet, first established as a trading post in 1846 and the home for many years of the late U.S. Rep. Julia Butler Hansen. See orange, pay attention. See orange, slow down. Is orange your color? This week, yes. Many of us just can’t pull off orange. And that’s the point, really. Orange is something you notice – something that gets your attention. So it’s time again to get drivers attention. This week is National Work Zone Awareness Week, the week where transportation and safety groups remind drivers why they should slow down and pay attention when driving through work zones. It’s the week to remind you that the men and women working out there on the roadway just want to go home at the end of their shift to family and friends. Tragically, some don’t. WSDOT honors the memory of those lost, and looks toward a future when every employee makes it home safely each day. If you don’t want to do it for the worker, do it for yourself and those you love. Why? Four out of five victims in a work-zone crash are a motorist. We would like to thank all those going orange for work zone safety. Many of our partner agencies helped spread the word this year. And a special thanks to those whose orange attire may have required a step outside the comfort zone. This week (April 4–8) is National Work Zone Awareness Week and with work zone crashes averaging 13 a week, it is a good reminder of the critical need to drive safely when encountering construction. Most people mistakenly may think that the real danger work zones pose is to roadway workers, but nearly 85 percent of fatalities in work zone crashes are those driving or riding in the cars. The good news is these deaths have declined significantly over the past eight years (1,186 fatalities in 2002 to 667 fatalities in 2009), but the ultimate goal is to prevent them altogether. · Plan Ahead – Check for planned construction before hitting the road. AAA’s online TripTik® Travel Planner alerts drivers to long-term construction areas, and the free Trip-Tik Mobile app helps drivers navigate a detour (with a passenger’s help of course). · Slow Down – Speed limits are normally lowered in work zones, and several states double fines for speeding in these areas. Drivers should take these speed limits seriously and allow for extra time to slow down when approaching work zones. It is also key to leave a safe distance between vehicles ahead, as conditions can change quickly. · Stay Alert – Watch for police officers, fire fighters or road crews giving instructions, as well as for any posted advisories or signage. Keep distractions in the car to a minimum as cones, flashing lights and unusual barriers can pull your attention away from the road. Drivers also should never turn off their vehicles when stopped on the road in work zones unless instructed to by a uniformed worker or the specific length of a delay is known. Following these simple guidelines along with exercising patience while traveling through these areas will go a long way toward saving the lives of both those who improve our roads and those who travel them. In honor of this week, the Foundation is also highlighting our Driver-Zed training program during the month of April. Designed for novice drivers, this training program allows users to learn how to safely navigate through different driving scenarios – including through work or construction zones. While we will be turning our website and social media accounts orange, I can assure you, you won't see orange ferries on the water. Friday! Friday! Gotta BE SAFE on Friday! That’s right, the AAA Foundation for Traffic Safety can count itself as one of the 64+ million viewers of YouTube’s latest video sensation: Rebecca Black’s “Friday” song. While we, like so many others, found the song unexpectedly beguiling, we couldn’t help but fixate upon one startling element throughout the video: the blatant lack of seat belt use. Funny as that sounds, it potentially demonstrates an underlying lack of concern for safety among young adults out having a good time. Understanding that this video is fictional, the fact that it targets young, impressionable audiences and portrays cool looking teenagers riding improperly in both the front and back seats of a convertible sends a dangerous message in an otherwise fun video. It’s a great example of safety being overlooked as a priority and unfortunately reflects the current state of our traffic safety culture. Teen driving safety is one of the cornerstones of the AAA Foundation. Habits developed by teens when first learning to drive can last a lifetime, and those habits should be safe ones. A seat belt is a person’s absolute best defense against injury or death in an accident. The National Highway Traffic Safety Administration (NHTSA) reported that in 2009 alone, seat belts saved 62 percent of teens (ages 16-20 years old) involved in fatal car crashes. So whether you’re “kickin’ it in the front seat” or “partyin’ in the back seat,” the coolest thing anyone can do is buckle their seat belt. You can’t “get down,” “hang out” or have “fun fun fun” if you never make it to the party. No matter what day of the week, every day should include safety, and safety means always remembering to buckle up.